Private Mentoring sessions are a minimum of one hour - $48 for the first hour, $22 for each additional half hour beyond the one hour minimum. Up to three additional students may attend a private class or mentoring session at Bobbin House Studio for $12 per person per hour. Special rates for larger group classes, workshops and lectures. Please contact me for additional information. I like to make your classroom experience fun for both of us! 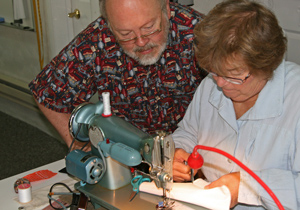 As both a sewing machine technician and an award-winning sewer, I bring a wide range of expertise, knowledge and perspective to my classes and mentoring. I know and understand how machines work and how they can affect successful sewing technique. I’m also knowledgeable of and experienced in advanced sewing techniques for a variety of applications. Combined, these qualities provide me with the skill and ability to help students understand the how and why of producing excellent work and maximizing the potential of your sewing machine. Here, a student chose to be mentored in how to do an accurate, inset quilt block. In mentoring, I will guide you as much or as little as you wish. My classes are well received and students look forward to the next one. My teaching style has been described as enthusiastic, fun, detailed, patient, and easy-going. The list of available topics continues to grow and expand. If there is something you are interested in, but don’t see it listed, please let me know what it is. Chances are, we can develop a class to meet your specific interest and need. The buttons on the left will link you to a detailed description of each of the current topics. Classes are pre-planned and topic specific. They are best suited to learning specific topic-focused areas of study and mastering the related techniques. 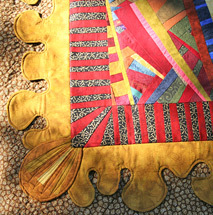 Each class is intended to provide both an over-view and basic mastery of one or more sewing techniques used in the project. These techniques are easily transferable to other sewing projects. Mentoring sessions can be pre-planned and/or topic specific, but their intent is to be more free-form in style and structure. Mentoring is best suited for the inquisitive student who wants to actively participate in determining the topics to be studied. Sessions may have a theme but are usually more spontaneous in direction, focus and content than a structured class. Mentoring provides the student flexibility in exploring a wide range of topics in one session rather than limiting the focus to only one topic. Individual mentoring can be a simple one-time session, or multiple sessions. A schedule can be structured that best meets your needs – weekly, bi-weekly or monthly, and sessions can range from ½ hour to several hours in length. As a student, you have complete flexibility in what you want to focus on - beginning sewers often start with basic machine operation and technical skills like adjusting tension and using specialty feet or threads. More experienced sewers may choose to pursue specific projects ranging from making tote bags, simple garments to more complex projects like fine shirt making, quilting or pattern alteration and design. Projects will often involve learning new technical skills that can be applied to a variety of sewing applications and future projects. With the mentoring format, each session can cover a variety of topics which are of interest to the student. Mentoring can be a fun and engaging method of learning for a small group. Mentoring is more of a challenge with larger groups as the experience can quickly become a question and answer session on narrow topics of specific individual interest which may not be of interest or meet the expectations and goals of the broader audience. 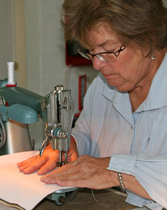 All but the basic beginning classes require some basic sewing skills and knowledge. Any specific skills and experience which are required will be noted in the class description. Some Bobbin Doctor specific classes may need to be taken consecutively in order to build a comprehensive skill set necessary to maximize the benefit and learning experience of a subsequent class. This also helps to insure all students will begin each class at a similar skill level and with a common understanding of the related concepts. Any necessary pre-requisite classes are indicated on the specific class description page. Bobbin House Studio is a fun place to share your learning experience with a friend or family member. You can stay alone, or with a second person, in the second floor guest suite and schedule a mentoring session or a class or two. And if you like, stay up all night sewing in your pajamas! 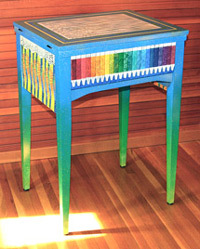 See the EDU-VACATION page at Bobbin House Studio. The studio space at Bobbin House can accommodate up to 4 students at a time so a few friends can join you for a small group class or mentoring session. As with individual mentoring, group sessions can be structured to meet your interests, schedule and budget from an array of topics. I also lead classes and workshops, and I present lectures to groups and events out in the community. Your group can be 4 close friends or a large organization with dozens or hundreds of members. We can create a program that lasts only an hour, or develop a workshop that can last for days! Please contact me if you’d like to explore a group class, lecture or workshop. I'm available for travel to lectures, special events and conferences. Please contact me for details.